In my family, we always have leg of lamb at Easter -- usually with asparagus and some kind of roasted potato -- and it's always served with "mint sauce." Before you recoil from your computer screen in unbridled horror, let me assure you that this sauce bears absolutely no relation to that cloying, emerald green goop commonly known as "mint jelly." With this mint sauce, there is not a whiff of gelatin in sight, nor an inkling of that chemically engineered green hue. 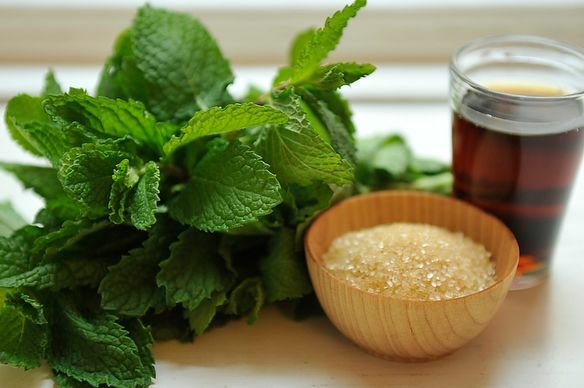 Rather, it's a simple condiment showcasing the bracing quality of fresh mint, made lively with the tang of vinegar and mellowed by a little sugar. This mint sauce is fleet-of-foot, capable of cutting through the richness of lamb with just the right mix of acid, fragrance and sweetness. The recipe I've come to favor (in fact, I made it on Sunday) comes from one of my favorite resources for oldies-but-goodies: The Fannie Farmer Cookbook. I've tinkered with it a bit over the years, substituting sherry vinegar for white vinegar, using demerara sugar and amping up the mint. I also add a pinch of salt to really bring out all of the complementary flavors. Give it a shot the next time you make lamb -- I promise you'll be glad you did. Bring the vinegar and sugar to a boil in a medium saucepan, stirring occasionally to dissolve the sugar. Boil for a minute and then remove from the heat. Stir in the mint and salt and let the sauce sit until it comes to room temperature, at least 30 minutes. Serve with leg of lamb or rack of lamb. Oh! Just found the Fannie Farmer cookbook on Amazon.com. Hi, I'm in Winnipeg, Manitoba (Canada)....where can I purchase a Fanny Farmer Cookbook??? I need one! Thanks for your help. I imagine you could find it on Amazon. It's a popular cookbook available all over the States. Fannie hasn't failed me yet... The Fannie Farmer cookbook that my sister, mom, and I all have is like turning to your grandma for cooking advice! Mmmmm, this sounds wonderful; and no gelatin, nor preservatives! Thank you Merrill!! Mrs. Larkin, I've got a soft spot for that jiggly green jelly, too. I'm giving Merrill's a chance, for sure. It sounds so refined. And I have some leftover lamb. No judgments here, people! If mint jelly is your thing, I say go with it. I think I'm going to have to whip this up to go with our lamb leftovers. Yum. We make this with malt vinegar and it's fantastic. Great idea! I'll have to try that next time. We had a store bought mint sauce which my husband loved, made with vinegar and no sugar! Glad to have this recipe for the future since we had chops for Easter with no leftovers. It sounds great! My sister said in England they have "minty sauce" which seems to be about the same thing. Yes, in fact that's why I grew up with it (my grandmother is from New Zealand, so my mother grew up eating a lot of traditional British dishes). Saw you made it already -- what initiative!